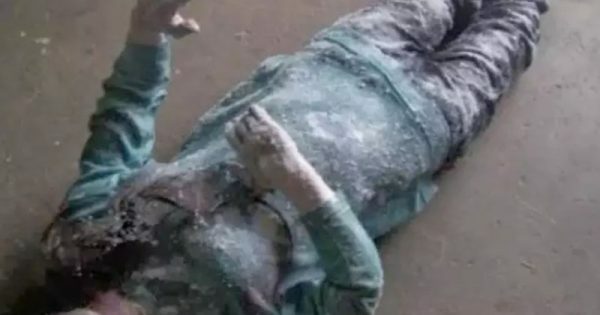 In 1980, a Minnesota woman named Jean Hilliard was literally frozen stiff for several hours in subzero temperatures. No, it isn’t a hoax. Hilliard collapsed on a 22-below-zero night as she was trying to seek shelter after a car accident. Six hours later, she was found “frozen solid” and was brought to a hospital. Jean’s chances of surviving were quite slim, and her body temperature didn’t even register on a thermometer, meaning her body temperature was less than 80 degrees F.
“There was no evidence of a pulse or blood pressure,” Sather’s brother, Dr. Edgar Sather, told the Gazette at the time. 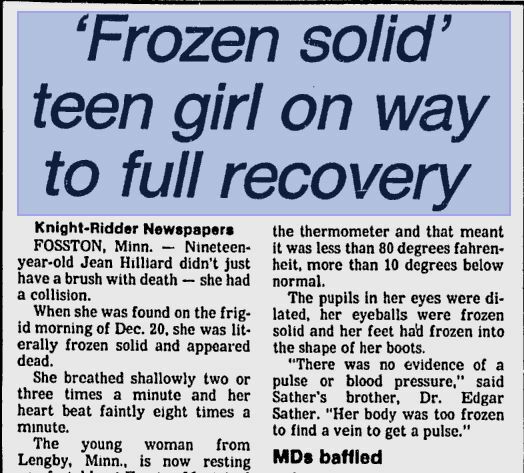 According to AP, it was too cold to give her an IV as “she was frozen too solid to penetrate the skin,” Edgar Sather said. But she ended up making an unusual and miraculous recovery. ”At worst, I might lose a couple of toes,” she told AP at the time. About a month and a half later, Hilliard walked out of the hospital alive and healthy. Many of the stories about her recovery say that electric heating pads and oxygen tanks were responsible. “Mrs. Erickson hurried to her office and made a phone call to the prayer chain chairman at the Baptist church where her husband is pastor. The prayer chain was set in motion. The prayer chain was lengthening. Mrs. Erickson called the pastors of the Lutheran, Catholic, Methodist and Bethel Assembly churches in Fosston. They, in turn, called the chairmen of their prayer chain groups, who passed the word along. During the first hours that the prayer chain was underway, my legs and feet, instead of getting darker as Dr. Sather expected, started to lighten and regain their natural color. One after another, the doctors and nurses filed in to marvel at the pinkish tinge appearing at the line of demarcation where the darkness started on my upper thighs — the place where Dr. Sather said he thought they might have to amputate. Dr. Richard Iseke said in 1981 that it’s not uncommon for freezing victims to make full recoveries. 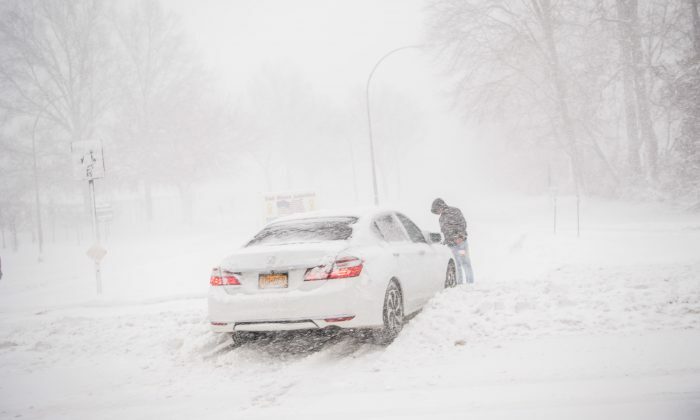 “There’s a term we have that says no one is dead until he’s warm and dead,” he said. However, Hillard’s story isn’t unheard of, as the Washington Post published a story saying a Pennsylvania man, Justin Smith, almost froze to death. He was out in the cold for 12 hours after passing out, and his body temperature got to a frosty 68 degrees F.